Vale is constantly maintaining a sound exposure in iron ore and base metals market fundamentals. A moderate correction in prices of iron ore in the medium term is supported by slower global economic growth and lower price premiums. The company still faces legal and regulatory risks after the mine disaster with the possible arrest of a senior executive. The recent weakness in the prices of iron ore was the result of lower winter price cuts. A few steel mills have been negotiating with the local governments on exemptions from winter cuts after mill closures during the summer season. Around 20% of blast furnace capacity were affected in 2018 as compared to 30% in 2017. Vale SA (VALE) remains supportive of the Chinese iron ore supply-demand market dynamics. Analysts see this as supportive of the push to higher iron ore grades. The company remains disciplined in its iron ore production strategy with a focus on premiums without aggressive pricing. VALE is also anticipating additional capital returns in the succeeding years. Bloomberg Markets (Iron Ore's Rally Is Living on Borrowed Time. 01 Feb. 2019). The company's operations succumbed to downfall after its tailings dam collapsed at the Feijão mine in Brumadinho, Minas Gerais. The tragic collapse paralyzed the mine operations in the area, which ushered a large number of fatalities and environmental damage. Mining.com (Hundreds still missing following Vale's dam break in Brazil. 25 Jan. 2019). The Feijao mine disaster left a minimal impact on its mine site accounts. Less than 2% of its total 390 million annual iron ore output was affected by the disaster. The iron ore mine has a capacity of around 30 metric tons per year. The company has been preparing on legal options to enable plans to decommission 40 metric tons per year of production over the next one to three years. 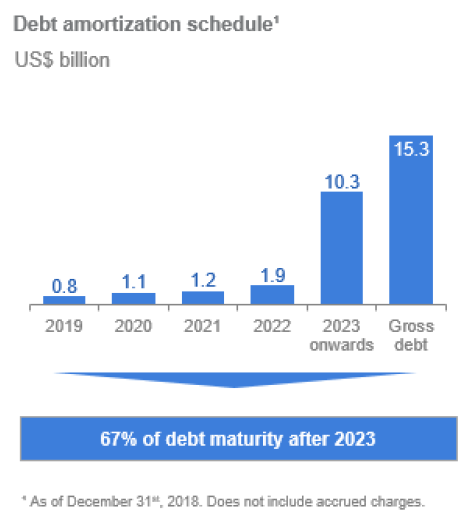 This is equal to approximately 10% of 2019 planned output of 400 metric tons. Mining.com (Vale dam collapse: Panic after fresh alert at another mine in Brumadinho. January 2019). I believe that there will be a minor focus on tailings dam safety in the meantime. The government has yet to quantify the extent of their penalties. I also believe that the regulatory authorities might not accept the company's decommissioning plan. The authorities are now proposing deeper price cuts. Alternatively, they might even block any offsetting production increases after the mine stoppage. Financial penalties being applied involved courts blocking BRL 11.8 billion or $3.1 billion of Vale's cash position. VALE has been sued in about BRL 350 million or USD 90 million by the Brazilian Institute of the Environment and Renewable Natural Resources and by the Minas Gerais Environmental Agency. 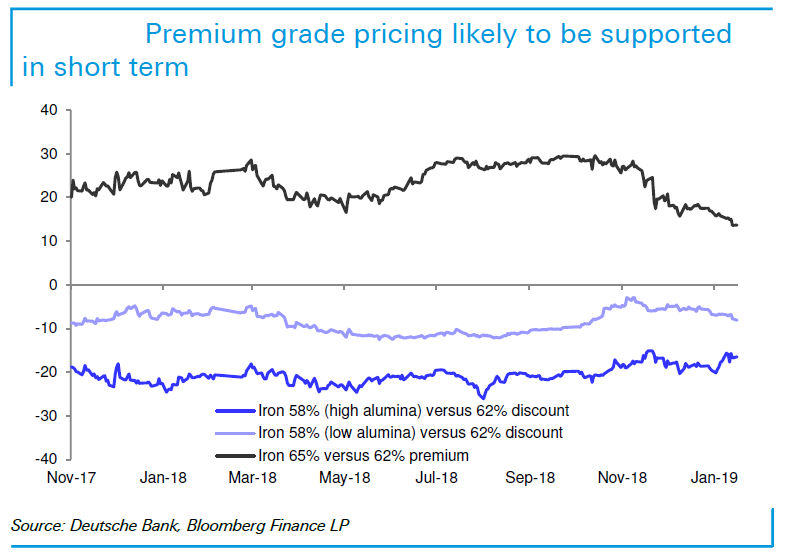 Meanwhile, Barclays (BCS) maintains a Hold rating on VALE, they believe that the stoppage will continue to be supportive for iron ore supply in the short term. They mentioned that VALE is set to benefit from higher offsetting production outages. They also noted that the final decision of the regulatory body related to Vale's iron ore supply remains to be doubtful. Barclays (Vale: Capex On The Rise But Holding The Line On Iron Ore Production). 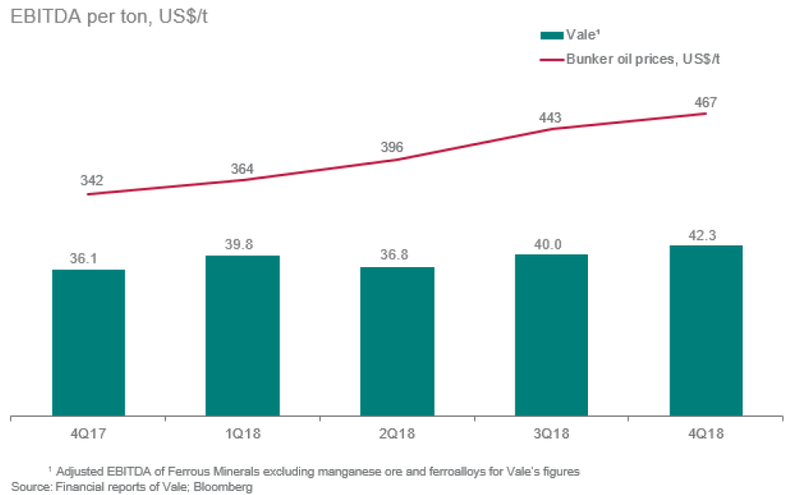 VALE's strategy in iron ore supply is to maintain seaborne production at 400 million tons per annum. 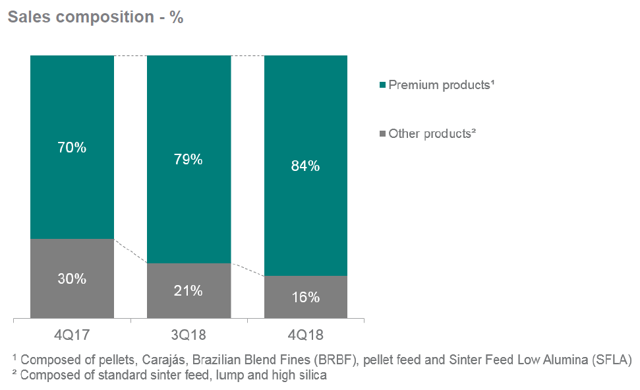 They also announced an increase in its "premium" share of production from 81% in 2018 to 95% by the year 2022. Premium products include pellets, Carajas 65%, BRBF, pellet feed, and low-alumina sinter feed. However, the company maintains limited announcements on issues related to the split of these individual product sales. VALE also formed a new partnership with Glencore Plc (OTCPK:GLNCY) to explore the nickel rim in the south deep mines of Brazil. I believe this will lessen the operating expenditures and capital expenditures for both companies instead of doing separate exploration development. The agreement between the two companies covers development feasibility studies over the next 12 months. The agreement will also allow VALE to access GLNCY's production shaft at nickel rim south and VALE's ventilation shaft. No new shaft will need to be constructed to explore the nickel ores. The initial production could start in the year 2025 depending on the outcome of the feasibility study. It will produce 30,000 tons per annum of copper peaking at 40,000 tons and 11,000 tons per annum of nickel. Company website (Vale Financial Statements 2018 IFRS 4T18). The market for iron ore remains in surplus while pricing remains moderate. Iron ore prices have risen higher since the dam collapse. It peaked at close to $86 per ton last January 2019. Prices trade within the $60 to $80 per ton. VALE plans to keep its guidance on fines close to 400 metric tons per year. Analysts do not see a fall in ore prices to $50 per ton. However, VALE will be ready to adjust its production if it does. Chinese supply-side reforms prevail to assist in the preference for iron ore with a larger iron content with lower impurities. This uncertainty has supported the price trend. The higher risk exposure of further price cuts led analysts to believe that ore prices are well supported in the short term. Thus, I anticipate that iron ore prices should moderate over time as the supply-disruption risk premium dissipates. VALE has worked in the past two years to expand blending capacity in Malaysia and China. Each site needs some amount of base level material to blend. This would suggest that the company will be reluctant to reverse inventory. It will focus on the medium-term business capabilities or flexibility in product grade. ABC News (Iron ore prices are surging and some analysts are tipping it will hit levels not seen since 2014. 06 Feb. 2019). The company could draw down inventory while prices are high and then restock when prices are low. This will result in less volatility in the iron ore market. Historically, the company believes that a range bound iron ore price is best for its business to discourage competitors from piling capacity at high prices. Average iron ore grade for 2019 will possibly have an impact on a high of 65% versus low grade 58% index spreads. But these spreads are also subject to environmental considerations. Deutsche Bank (NYSE Investor Day: Shifting Gears to Base Metals opportunities). The mine disaster left three hundred people dead that led to mine shutdowns where 80 million tons of iron ore are stored. The news of restarting a mining operation after the tragic event in the dam does not create a significant negative impact on investors. But it could result in a spillover effect in the market for iron ore, which resulted in soaring iron prices after the dam disaster. According to Bloomberg, prices of iron rose higher than 20% in the first two weeks of February. Bloomberg Markets (Vale Mine Ruling Has Analysts Weighing Iron Ore Market Impact. February 2019). The social damage is far more serious. The Brazilian federal prosecutors are seeking the arrest of their senior executive, Peter Poppinga. Based on the report of Financial Review, "Poppinga represented a risk to the public order and his freedom could hurt the enforcement of criminal law," said prosecutor Gustavo Oliveira in the arrest request originally filed on February 11. Mr. Poppinga has not been arrested after a judge declined to issue a warrant. However, prosecutors are eager to seek his arrest in an appeal of the judge's decision. Financial Review (China's iron ore posts weekly loss, Brazil seeks arrest of Vale executive. February 2019). The company plans to generate an additional $7.7 billion in earnings before income tax depreciation and appreciation (EBITDA) equivalent to a year-on-year increase of 46% in 2019. Their strategic focus is to increase the company's average grade of the product portfolio. In addition, they want to reduce costs to increase EBITDA while working towards the turnaround of the base metals division. Most of the company's nickel assets are operating below historical capacity levels and it lags in terms of EBITDA margins. A spinoff of its Base Metals division is unlikely. The company believes that this division will experience a turnaround through cost reduction and production optimization. They are targeting a 20% internal rate of return (IRR) for new projects with a long life of up to 30 years. Deutsche Bank (More Twists and Turns Expected Following Brucutu Mine Outage). The company had $6.1 billion in cash and $5 billion in committed credit facilities availed. However, the company has suspended its dividend payments, disbursements of bonus to senior executives, and share buybacks. This will unleash more financial resources for the remediation of the affected mine sites. The company increased its capital expenditure by 10% to $4.4 billion in its 2019 guidance. They expect capex to climb by 7% year-on-year to $4.5 billion in 2020. It will be maintained at $4.5 billion per annum going forward. This figure will be driven by the vast majority of new iron ore capital expenditures, which delivers no net increase in volumes. Net debt is now at $10.7 billion. Portions of free cash will be used for further small bolt-on acquisitions and most like no significant divestments being planned. To recap, I believe that VALE still faces the risk of operational penalties from the regulators. Their proposal for a decommissioning plan may not be approved as well. Hence, we could expect a more challenging regulatory environment for licensing in Brazil. Iron ore prices have surged higher since the tragic dam collapse occurred. The uncertainty of the situation has supported this price path. Iron ore prices are well supported in the short term, given the higher risk of further price cuts that are emerging. I also believe that VALE sees steel and related raw material prices are in backwardation mode due to concerns on the sustainability of China development. The rate of the slowdown is lower-than-expected and this trend will continue in 2019. Additional disclosure: If you found this article to be informative and would like to hear more about my investment research, please consider hitting the "Follow" button above.